Club Med for Singles, Couples or Families – Which Fits YOU Best? Club Med holds a special place in my heart. It’s not just because I experienced some of my happiest travel memories at Club Med. It’s also because the brand offers incredible vacations, no matter your stage of life or travel preferences. Club Med designs its resorts to fulfill the vacation wishes of three target travelers: singles, couples, and families—allowing vacationers to hone in on the type of property that gives the travel experience that fits YOU best. My very first real vacation as a grown-up was at Club Med. I was 28 when I booked a solo trip to Club Med in Sonora Bay, Mexico. I chose this resort brand because it fit my budget; it was all-inclusive; and their literature said it would be easy to make friends. I had a fabulous time! Since I paid for the trip up front, I was able to really enjoy my week away. I didn’t have to spend money on anything besides a few extra excursions and my bar tab. And I met people during that vacation who have since become lifelong friends. For those traveling without a significant other, take a look at Club Med Buccaneer’s Creek in Martinique. Facing the Diamond Rock, this resort offers spa services, endless water sports and a host of fun excursions. My first Club Med vacation was so much fun that I decided to book a Club Med getaway the next year. On that trip, I met my now-husband. Two years later, we got engaged at Club Med Sonora Bay. Six months after that, we honeymooned for three weeks at Club Med Paradise Island. I like to call Club Med summer camp for grown-ups. The endless array of water sports, land sports, excursions, restaurants and social activities can keep you busy from sunup to sundown—but only if that’s the kind of vacation that YOU like. I’m a tennis player and I spent all of my trips at Club Med playing four to five hours of tennis a day. For me, that’s relaxing and fun. For other people, laying by a beach or on a chaise lounge next to a pool is what vacation is all about. Love sailing, golf, scuba diving, skiing, or spas? Club Med offers that as well. It’s all about choice: your vacation, your way. For a romantic getaway, I’d recommend Club Med Columbus Isle in The Bahamas. This resort is a premier scuba diving destination and has a more upscale, luxurious feel than some of the family resorts. Families with children can spend the day splashing in the pool, making sand castles on the beach, or playing sports together. You can also utilize their children’s care program and leave them in the hands of the young, outgoing counselors who ensure your offspring have a wonderful time. Kids’ programs are organized by age group and are full of fun activities like tennis, water sports, and trapeze school. There’s even a Baby Club Med program for children as young as 4 months, so that you can enjoy a getaway without having to leave your baby behind. 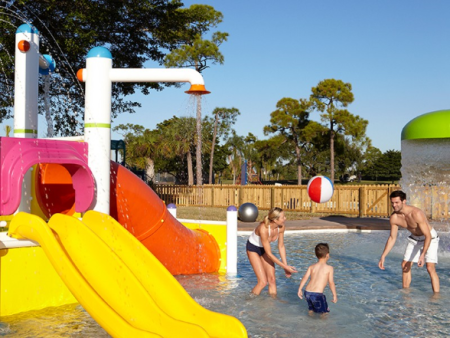 If traveling with kids, I suggest spending your holidays in Florida at Club Med Sandpiper Resort. This resort has academies for golf, tennis and fitness, as well as trapeze school and an aqua park for the kiddos—and that’s in addition to the regular childcare programs. Have you ever vacationed at Club Med? Tell us about your experience in the comments below! A Note from The Organized Travel Mama: This post was sponsored by Club Med. All opinions are my own. All photos courtesy of Club Med. Home » BLOG » Club Med for Singles, Couples or Families – Which Fits YOU Best?